Government has banned family members and any other person from visiting prisoners at Mukobeko maximum security prison after allegations that 18 prisoners were beaten to death by government security officials. And the government through the Zambia Prison Service (ZPS) has place a KR10, 000 rewards on the head of each fugitive. 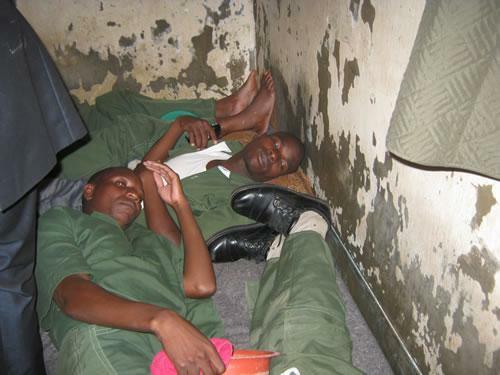 18 inmates serving various jail sentences at Mukobeko were allegedly battered by prison warders after express instructions from the top command who fear for their jobs after 3 prisoners escaped the nation’s maximum security prison. The three escapees are Derrick Mwape, Bernard Kapaso and Shadrick Phiri who are all waiting to be hanged in prison. According to sources from the prison services, the prisoners were accused of having helped their inmates to escape and got a beating as punishment. The escape and matters surrounding the battering and death of the 18 inmates was supposed to be a top secret Kasempa member of Parliament (MP) Kabinga Pande (MMD) complained in parliament on Tuesday. Home affairs Minister Edgar Lungu was forced to issue ministerial statement to parliament but as everybody would expect from PF officials, he denied the allegations. On the ban on visits, Lungu said it will only be lifted depending on the outcome of an inquiry into what led to the escape of the three prisoners. “As a result of the escape, a special search was conducted at Mukobeko Maximum Security Prison in all sections, to remove all prohibited articles as well as establish if there were any further threats to security. The officers discovered that the three escapees used a sharp instrument to cut the metal which fastens the door of the cells and escaped,” Lungu said. He said the search was met with resistance from inmates and who became unruly and in the process, abducted one prison warder whom they held hostage and demanded that officers discontinue the search as a condition for releasing him. Mr Lungu said 300 recruits were brought in to reinforce the officers to rescue the warder and also to continue with the search and secure the prison. He said only 300 recruits were deployed inside the prison, contrary to allegations made by Mr Pande that 600 recruits were deployed at Mukobeko. “The search yielded positive results. Various offensive weapons such as screw drivers, knives, dagga and many other prohibited articles were recovered,” Mr Lungu said. He said the situation at Mukobeko Maximum Security Prison is calm.